MyStudyBar - Suite of Portable Applications to Support Learners with Literacy Difficulties. It can be run from a USB pendrive or from your desktop. We recommend reading the 'Using MyStudyBar tutorials' section below. MyStudyBar is designed to support the complete study cycle from planning and structuring thoughts and ideas to support with reading and writing. 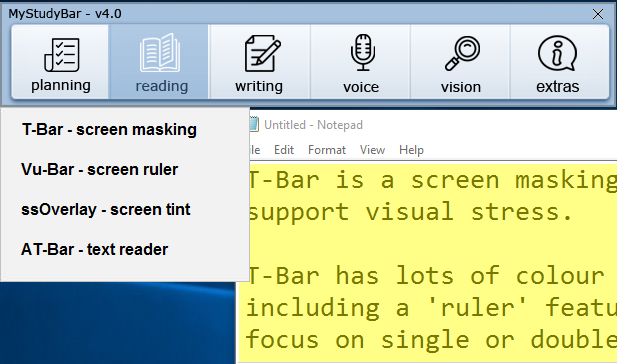 Although MyStudyBar is designed to support learners with literacy-related difficulties such as dyslexia, the toolbar can offer potential benefits to all learners. As MyStudyBar uses portable applications it does not need to be installed. MyStudyBar can run from a USB pendrive or you can copy the programs to your desktop. Technical staff in schools, colleges or universities can also run MyStudyBar from the network for everyone to use. MyStudyBar is an excellent software tool that can help overcome barriers associated with dyslexia. It can support the whole study cycle and assist with getting across a spoken or written message. It is completely free of charge to download and to use. MyStudyBar can be a great help to persons with literacy difficulties and is accessible even to those with unsupported, or hidden, dyslexia. There is no Apple Mac version, MyStudyBar is designed to run on a Windows PC. For a full list of Apple Mac portable apps visit the FreeSmug Site. After you've downloaded the file you then need to run the installer which will create a folder containing the MyStudyBar application and files on your desktop (by default) or USB stick. Click 'Next' and read the information. Click 'Next' and choose where you would like the folder placed (desktop by default). The MyStudyBar folder should now be placed on your desktop (or USB stick). Click on 'Next' and then 'Exit' to finish. The extraction process may take about a minute. Find out more on technology to support dyslexia. Items in the System Tray: Please note, when using ssOverlay (colour overlay) and LetMeType (word prediction) settings can be found and adjusted from the System Tray (bottom right side of the screen). 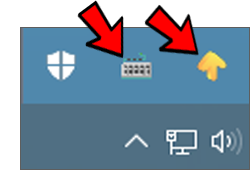 Both ssOverlay (yellow arrow icon) and LetMeType are closed by right clicking their respective icons in the System Tray - LetMyType (keyboard icon). We are grateful to all of those who have contributed to the development of the software that is included in MyStudyBar: Vu-Bar; ssOverlay; Blabolka; Rapid Typing; XMind, LetMeType and System Font Size Changer. Special thanks to EA Draffan at Southhampton University for ATBar and to Soffed Ltd (the original developers of EduApps) for allowing CALL to continue further development of MyStudyBar. Also a big thank you to Julie MacRitchie, Disability Advisor at Queen Margaret University for writing the guides. Thank you to Jisc for their continued support. And thanks also to Robert Stewart (Technology Resources Officer) at CALL, for all his hard work and help in updating MyStudyBar. The software applications that comprise MyStudyBar are distributed by CALL Scotland "as is" and any express or implied warranties, including, but not limited to, fitness for a particular purpose are disclaimed. In no event shall CALL Scotland be liable for any direct, indirect, incidental, special, exemplary, or consequential damages (including, but not limited to, loss of use, data, or profits; or business interruption) however caused and on any theory of liability, whether in contract, strict liability, or tort (including negligence or otherwise) arising in any way out of the use of these applications, even if advised of the possibility of such damage.